Rainbow sprinkle confetti birthday ideas to make your party amazing! It’s confetti time! If you’re planning a confetti themed birthday party, you’ve come to the right place. There are some amazingly colorful – and creative – confetti birthday themed ideas. Whether you’re looking for confetti themed food, favors, party hats or invitations – let the sprinkles fall! Just take a look at all the confetti designs our party dog has uncovered. He’s definitely ready to party! Smash cake for your one year old! Free confetti theme party hat printables! These adorable water color confetti theme hat printables are available from twinkle twinkle little party!. I love the tops with the colorful streamers – so easy to make and so look so cute on the party table – and on the kiddos! And, best of all, the printables are FREE!. Funfetti recipe can be found here. This baker mama knows how to make a mean confetti cake! Her own description says it perfectly – “This naked confetti cake is a celebration in itself! Best of all, there are three layers of fun! Nothing says fun like a sweet funfetti cupcake – they just make you smile looking at them! The confetti delicately shows through the cupcake while the sprinkles on top make them extra coloful. Let your guests create their own sprinkle cupcakes! If you’re feeling adventurous, let your party guests create their own rainbow sprinkle confetti cupcakes. Using artists pallets, you can prefill the glitter and toppings and watch the creations unfold. From Jenloveskev, you can read more about the “Little Artist Party“. Create your own giant confetti balloon! The DIY network has complete step by step directions on how to create your own giant balloon filled with colorful confetti. These would be a super fun giveaway too for the kiddos – just make sure you have enough confetti for everyone. We found this adorable marshmallow sprinkle tower on Karaspartyideas! They look super easy to do and make quite a visual with the towering layers. Best Sellers! Confetti invitations – your colors – your style! Our confetti invitation suite continues to be one of our best sellers. We started with bright rainbow colors of green, blue, red, yellow and purple. One mom contacted us and asked if we could make this with pastels and maybe some gold? Yes, we did. We also were asked to make circus / primary colors invitations for a third birthday invitation and also a pink / purple versionfor a four year old. You can find all of these in our etsy shop! Add more confetti for party fun! With the confetti party pack, you can get a Happy Birthday banner, cupcake toppers (perfect for the funfetti cupcakes), Welcome sign, foot tent cards, favor tags and a thank you note – all in one easy to print download – only $20! Fully editable so you can add your kiddo’s name to the designs. More confetti themed birthday invitations below! Confetti streamers and party hat! Add your favorite photo to this fun confetti themed party invitation with “HOORAY” in a fun party font. For your party girl – or party boy – this invitation would look super sweet with their photo. If you’re mailing invitations, you can find fun birthday themed postage stamps – including some with confetti! The colorful confetti stamps below come on a sheet of 20 – and add a little extra to your invitations. There are stamps with gold confetti too! Milestone posters for one year old birthday party! Celebrate the milestones of your baby’s first birthday with this adorable milestone poster. Featuring favorite books, favorite foods, height weight and other accomplishments, this milestone poster would look so cute in a frame at the party. We have this poster available for all ages – we even created one for a 30 year old (he hates: paying taxes). Confetti party slime – yes! What party wouldn’t be complete without a little slime! The imagination tree has complete step by step directions – and a video – to show you how to make your own confetti slime. Who knew this used contact lens solution – interesting! Biodegradable rainbow confetti dots – add some fun to your tables! Etsy has plenty of colorful confetti dots available – below you can find biodegradable confetti which has both bright colored confetti polka dots – and is eco-friendly. There are plenty of places to toss the confetti. For example, you can sprinkle them on top of the table (make sure you use a table cloth for easier clean up). Or you can add them to confetti poppers (see below). DIY Confetti popper with sweet pastels! What a cute way to thank your guests for coming to your confetti themed party – just upload your favorite photo and you’ll have your thank you cards in no time! Colorful, cute confetti favor tags. What fun colorful tags to add to your party favors. These are awesome because you can personalize with the birthday boy or girl’s name. So easy – and so cute! We hope you found some creative ideas for your confetti themed parties! Some – but not all – of the links above are affiliate links so we would get a small compensation if you make a purchase. Free Bee Baby Shower printables featuring busy honey bees! We’ve seen a definite trend in the number of baby showers and birthdays featuring the sweet little honey bees. So we designed three free bee themed printables to welcome in the spring. In fact, we have THREE Free-bees for your party planning pleasure. A “What will it Bee?” poster above featuring mom to bee and baby boy and girl bee. Both sweet baby bees are adorable; the boy with his cute blue shoes and wings while the girl has a tiny pink flower to match her pink wings and shoes. If you’re having a gender reveal shower, this will be perfect for the display. Cute honey comb patterns in yellow, gold, orange and of course, pink and blue, decorate the border. The poster size shown above is 11 x by 14. Download, print and frame for your bee themed shower! Below is an adorable thank you card with the cutest little bee buzzing by a yellow daisy flower. Bee features cute pink cheeks with black and yellow body and antennas. Card reads “You’re as Sweet as can bee” in fun, flowing font. Inside is blank for your personalized message. As a result, this thank you card can be used for so many occasions – baby shower, birthday, or just to thank someone for their kindness. This free printable comes with two cards on an 8 1/2 x 11 sheet of paper. Free printable busy bee baby shower game. With cute bees on either side, the game reads “Sweet as can bee – Baby ABC.” The object of the game is to find a baby item which begins with each letter of the alphabet. (For example: zygote works for the letter Z.) At the end of the game, the one who finds all 26 (or the most) wins! In short, we hope you enjoy these free bee printables featuring busy bees! If you are in charge of planning a bee baby shower, you’re sure to find some great ideas from our “bee baby” shower post! If you need a custom design or special request – be sure to contact us. Plus – we now offer printing services too and will happy to work with you on invitations, thank you cards, RSVPs and more! 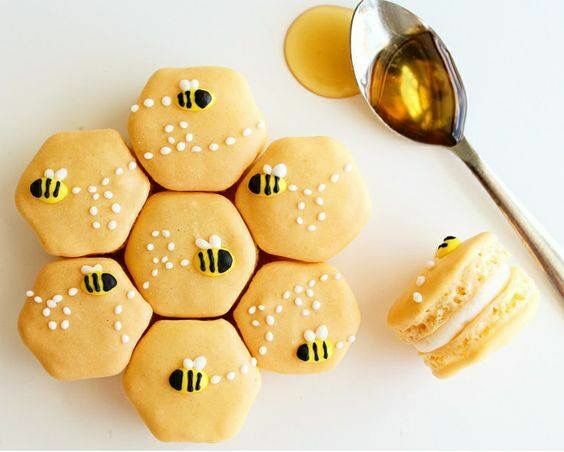 Bee Baby Shower Ideas that are sweet as can “bee”! Bee party styling by Chic Fête via instagram. Are you planning a bee themed shower? Busy bee showers have seen an increase in popularity – and for good reason. Bees are so sweet, colorful and cute! The good news is now there are so many more fun bee decorations available. The adorable bee theme above features honey bees, pastel yellow balloons and a “Sweet as can bee” welcome poster along with a delicious assortment of desserts. Check out more bee ideas below … plus I’ve included a FREE downloadable bee theme baby shower game! Sweet honey pot favors from beau-coup.com These cute favors will really add to the bee baby shower theme without breaking the bank! The favor features a white beehive decorated with cute bee drawings and a honeycomb stick with a white heart. One recent reviewer wrote: “They are perfect size and adorable. Purchased mini honey jars to go along with the honey pots.” Mini honey jars? Nice! Designed by Kate Aspen, these bumble bee-inspired frosted glass votives are available in two sugary-sweet designs that can both be personalized for the baby and / or the mom-to-be. You can fill them with lit candles and place around the tables. On the other hand, you can give them out as favors. Bee-licious! Ask your local bakery if they can match these fantastic looking cookies! This lovely selection is featuring honey bees of course, honeycomb and a cute white fern. But, if you like to DIY, head on over to Golden Bee Cookies for the recipe and decorating hints. Cake pops with a buzz! This little bee is so stinkin’ cute – I can just imagine having a whole beehive full of these. Find out how to create this bee cake pop (and a few other animal pops) over at hobbycraft. Need more cake? Bake a white or lemon cake, cover with white fondant and add some bee decorations and buzzy trail piping. If they’re in season, add some fresh daisy flowers to the cake. If not in season, you can purchase an inexpensive package of small plastic flowers from ebay, amazon or your local dollar store. Photo courtesy of the celebration society. Found via pinterest – if you are the original artist please contact me to be credited! Buzzed lemonade! Or maybe just regular old fashioned lemonade, Either way, these black and white striped straws add to the honey bee theme (and the mason jars are sweet too). You can find these straws at Party City. Handmade baby bees – too cute! And ba-bee makes three! Love these hand made bees! You can pick up a pack of three from etsy – or DIY with a little yellow, black and white felt. You can get the google eyes from a craft store. The antennas? Not sure what they are – look a little bit like the teeth of a comb. How do you turn an easter egg into a bee? Head on over to Martha Stewart and see. It’s actually pretty simple and as usual, Martha gives perfect step by step (9 to be exact) directions. These can be dangled from the ceiling to add extra buzziness. A complete buzzy bee collection I created with sweet yellow and black honey bees, hand drawn white flowers and a simple leaf pattern. I added this design to a variety of different paper products – and other decorations. As a result, you can find invitations, favor tags, diaper raffle cards, book request cards, baby shower games, banners, envelope liners and more. If you like to DIY and are looking for a printable, I also have that (as well as other matching pieces) in my etsy shop. The editable-printable shown below is only $10. It’s available immediately when you purchase and you can edit it yourself using adobe acrobat reader. Plus I now offer printing services with my invitations. Just contact me for details if you would like to know more or get a quick quote. Looking for more mommy-to-bee invitations? Below is an adorable mom and baby bee fluttering front and center . The whimsical, hand drawn bees have trails with looped hearts of love. Yes, love these! Dripping with honey and oh so sweet – this “mommy to bee” invite is available from etsy.com. Look at those pink cheeks, blue eyes and little tuft of hair. So cute! Here are six more super cute baby shower invitations – created by some very talented designers! 2 Soon to be family of three – with three cute buzzing bees. 3 Mama to bee with beehive hanging from the tree. 3 He or She – what will it bee? Cute invitation for a gender reveal party! 4 Three buzzy bees with green and yellow flower. 5 Pink flower – sweet pastel pink flowers with a couple of cute bees buzzing. Don’t forget the stamps! Buzzing through the mail – here’s a cute “what will it bee” baby shower postage stamp. These stamps come on self -adhesive sheets of 20 – and yes they are real postage stamps! This adorable “grandma to bee” pin is the perfect accessory for the grandmas (and great grandmas) at the party! There are several sizes available but you know grandma will want the biggest one! How many honeycombs are in the jar? This shower game really couldn’t be easier to put together. Buy a box of HoneyComb cereal, count them out and add to a daisy decorated mason jar. After that, make a cute sign and – done. Send them a cute “Sweet as can bee” thank you card. Download the free template from Colleen Michele! Looking for more bee themed ideas? You can find thousands of designs and decorations available. You can splurge if you like – or stay within your budget. Either way, you’re bound to find a cute bee idea or two to make your party bee-autiful! Happy December! It’s really almost Christmas now – where has the time gone? Happy Thanksgiving week everyone! I was playing around with watercolors today and sketched some Fall themed foliage – leaves, berries and branches. I drew them in a color scheme I absolutely love – golden yellow, fiery red, teal green, inky blue and autumn brown. You can print this Autumn-y, nature-y gorgeousness for yourself by downloading the free Thanksgiving printable I made! [Read more…] about Merry Botanicals Photo Christmas Cards + Free Gift Tag Printable!